One of my favorite aspects to ponder about God is him as Creator. I like to think that when I have moments of creativity, the energy coursing through me is His Spirit, and that my times of dreaming up new ideas are like prayer times for connecting with my Creator God. The times I feel so close to His soft whisper are when I'm writing or envisioning a new children's book or even singing a made up tune as I wash dishes. I think God is in those moments, and I was excited to see a book written from this perspective. 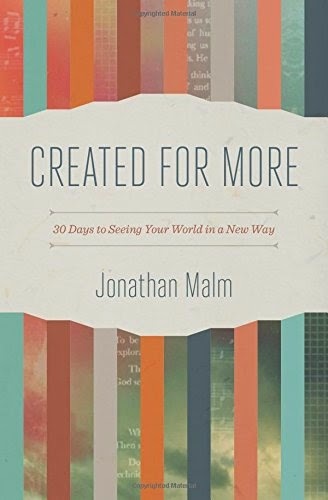 Jonathan Malm, in his devotional Created for More: 30 Days to Seeing Your World in a New Way, hopes to "awaken the spiritual act of creativity" within us by pairing scripture readings, devotions and a creative challenge. I'm going to focus on this hands-on component of the devotional, because I think that's what sets it apart from most other devotionals. Malm seems to target those who work in creative professions, since the challenges often involve taking an existing work task and modifying it (cut your resources in half or move the deadline up) or looking at it from a new perspective (avoiding familiar techniques or creating your work in public). Most of the ideas have a clear tie-in to the particular focus for the day's devotion. For example, performing your art in public is paired with a devotion on being brave and resisting the urge to fear others' opinions. There were also some sillier ideas, such as choosing your least favorite cartoon character and modifying him until he became "edgy" or walking into a room and envisioning how you might conduct an Ocean's 11-type heist. While I think these ideas will appeal to many professional creatives and the fun of creating something new as part of a spiritual discipline is something I aspire to, most of the challenges fell flat for me. Malm confesses to have started and not finished countless devotionals despite his love for God and work in ministry. This devotional is blessedly brief, with each day's quick read averaging about 3 1/2 pages. Still, I have to confess I opted out of the challenges, largely because they seemed too daunting for an introvert or time consuming or difficult to dovetail in with my particular creative endeavors. It wasn't a perfect fit for me, as a stay-at-home mom and struggling freelancer, but I think this would be a valuable devotional for people without three small children interrupting their every brainstorm. I think it will especially appeal to those working in multi-media, performance or fine arts.